Email communication is vital yet sometimes it can be hard to interpret. We believe that by paying close attention to how we communicate and by knowing how others perceive our communication to them, we get to know ourselves and we can get our message across more effectively. Emotional awareness and social intelligence in emails for better relationships - from families, to employees, to businesses. That’s what we want to accomplish! 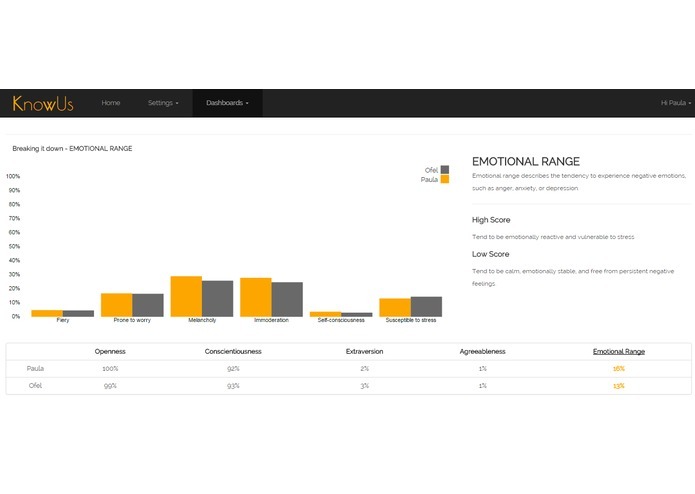 KnowUs analyzes individual emails to identify the underlying social, emotional, and writing tones present within the email body. Our Tone Dashboard gives you timeline visualizations on how you communicate in general and on how you communicate with a selected contact. 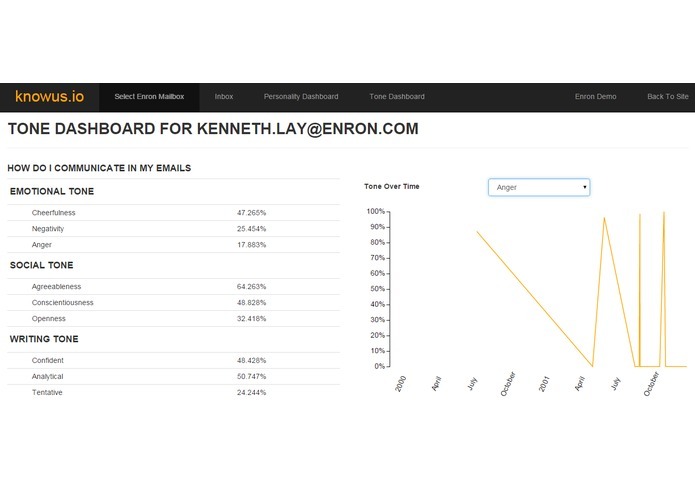 Kenneth.Lay@enron.com (imported mailbox) – Tone Dashboard. Notice the spike in Anger from May-Aug 2001. This was around the time then-Enron CEO, Jeff Skilling resigned. KnowUs develops an your overall picture based on the all the emails you've sent. We generate a Personality Model for you and we also generate a Personality Model of your contact based on the emails your contact sent to you. To better understand the similarities and differences between you and your contact, we put these graphs side-by-side! Our Personality Model dashboard has support for both English and Spanish emails. One last thing --- We take privacy seriously. We don't store your emails! Accounts Account creation and deletion are included in the application, re-enabling sources that are disabled has also been added. Sources Adding and removing sources via the source discovery api and managed UI process. Initial sync callbacks are used to trigger actions within the application. Messages Message body and metadata retrieval for user and contacts. Included message_body and additional folder information. Used the to, from, subject, date before and date after to further sort relevant messages and contacts. Used message information to get from a user’s contact. Webhooks Webhooks are used to import new mail messages into the application and perform analysis without the need for user interaction. We clean the message body to ensure that only pertinent text are used for further analysis. Cleaned messages are sent to Watson’s Tone API so get the Tone Analysis per email. All the messages sent by the user and all the messages sent by a user’s selected contact to the user are sent to Watson’s Personality API to get the Big Personality Model for the user and his selected contacts. Email syncing takes a long time for large mailboxes. This might have an effect on user experience. Used polling to mitigate the long wait time. Also, we persist personality and tone data to minimize Watson API calls. During testing, a Context IO dev account can have its mailboxes locked due to authentication issues. We created a complex product using multiple APIs and a product that can scale in a short period of time. We learned more about emotional intelligence and personality traits, and starting learned about which ones are important and why, such as the importance of conscientiousness on predicting both health and professional growth. We also learned about the impact of words on individuals and teams, such as how rudeness is contagious, and we learned how to quickly come together as a team to get a product out that has the potential to help a lot of people become better people. Longer term a automatic categorisation process could be implement to identify who to track. 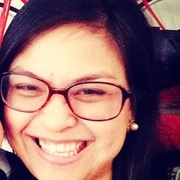 Cloud Software Developer at IBM, Systems Design Engineer, and just curious. Looking to dabble with Artificial Intelligence and ML! We tested IBM Watson's Spanish support on emails in Spanish http://ibm.co/1MpC3sx We get the full Personality analysis in our Personality Dashboard. We've made some UI changes, recently. If you haven’t noticed, our navigation bar for the KnowUs App has changed to a nested navigation menu. Hi hackers, we’ve recently upgraded our Linux server platform currently running on an Amazon EC2 instance increasing our memory and processing power, making email analysis quicker, and delivering personality and tone results to users faster. Distributed teams benefit from certain personality traits, show a study of IBMs team, traits that can be determined from text automatically. How does your team stack up? Results: For our sample of 146 practitioners, we found that the Top Members demonstrated more openness to experience than the Other practitioners. Additionally, practitioners involved in usability-related tasks were found to be highly extroverted, and coders were most neurotic and conscientious. People who test high in conscientiousness stay married longer, live longer, commit fewer crimes, they smoke and drink less; have fewer strokes, and a lower incidence of Alzheimer's disease. http://www.businessinsider.com/conscientiousness-predicts-success-2014-4. knouws.io will show you where you and the people in your inbox score automatically. Ken Lay was getting angry with Jeff Shankman heading into the unraveling of the Enron Fraud, Lay was ultimately convicted. Years later, Shankman was charged with fraud too, albeit in an unrelated personal matter. Knowus.io can track anger, cheerfulness, or even confidence exhibited between two people. Conscientiousness helps forecast your health, income, productivity, vices, alzheimers and even founder success says studies, but how do you tell if you are. One way is automatically through email. Knowus.io will not not only give you that over time, it will tell you where you are on the six different subtraits, such as self discipline. Additionally, find out how people in your network rate on conscientious towards you.